Thousands evacuated from Birmingham city centre faced "a real and very credible threat", West Midlands Chief Constable Paul Scott Lee has said. Mr Scott Lee declined to describe the nature of the threat but said intelligence indicated it was genuine. He said the decision to evacuate up to 20,000 people from the city centre had not been taken lightly and came after a "very specific threat". The city centre has now fully reopened to the public. Four suspect packages were blown up but Mr Scott Lee said they had nothing to do with the intelligence warnings. "The threat that we responded to was very specific," he said at a news conference. "It was specific about the time and also the locations." West Midlands Police put up an exclusion cordon around the A38 inner city ring road after the warnings were received. Mr Scott Lee said: "Bearing in mind the current world climate, the public's safety is our absolute priority," he said. "We haven't had this level of threat before (in Birmingham). "The people of Birmingham were in danger last night." 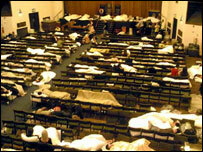 Hundreds of people left stranded by the evacuation stayed at Aston University overnight. At 0500 BST on Sunday bomb disposal experts declared that a suspect package at the Premier Travel Inn on Broad Street was not a "credible device". 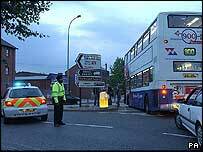 Police carried out four controlled explosions on a bus in Corporation Street, in the city centre. The areas cordoned off included the Broad Street entertainment district and the city's Chinese quarter which are crowded with bars, theatres, restaurants, flats and hotels. Speaking on the BBC's News 24 Sunday programme, Home Secretary Charles Clarke praised the response of the police and public in Birmingham. "There was a serious threat," he said. "That is why the police acted as they did. I think both the police and the people living in Birmingham acted entirely professionally. "The police would have been quite wrong if they had ignored the threat which came to them." West Midlands Police announced they had received intelligence of a possible threat to the area at about 2015 BST. Initially people were told to be on their guard, and that bars and restaurants were being searched. Motorists were also told not to come into the city centre. However, about half an hour later, police said the city was to be evacuated. But on Sunday life was returning to normal in the city centre with shops, bars and restaurants open for business. A spokesman for the Bullring Shopping Centre told BBC News that he did not think shoppers had been put off from travelling to the area. "Retailers are all open as normal, people are coming to the centre and the car parks are filling up. It is all fairly normal," he said. Average figures for people visiting the centre on a Sunday are between 80,000 and 90,000.